First I logged in to my nested ESXi server, and tried to vmkping an IP address on my iSCSI array. Even with non jumbo packets (1472 bytes or smaller) I saw a lot of packet loss. On my physical ESXi hosts and network, I could not find any specific issues. When looking at the vmmic counters on the nested ESXi host with “ethtool -S vmnic2” I did notice the “alloc_rx_buff_failed” counters where increasing, even when I did not try to send traffic over the interface. 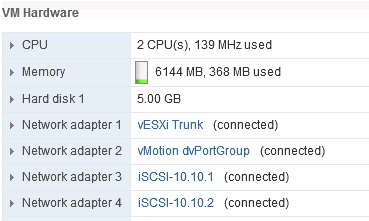 My other networks on the nested ESXi hosts dit not seem to have any issues. The only difference between these networks and my iSCSI networks was the iSCSI networks had jumbo frames configured. So I decided to change the MTU for the iSCSI setup from 9000 to 1500. First I changed the VMkernel port, so it would send out 1500 byte packets … no change … Then I changed the MTU for the vSwitch itself to 1500, and voila, connectivity was restored and “alloc_rx_buff_failed” did not increase anymore. So for some redone, the combination vSphere 5.5 as nested ESXi server and jumbo frames did not work. Since nested ESXi is not officially supported, opening a case at VMware would probably not help, so I reached out to “Mister nested ESXi” William Lam to see if he had experienced the same kind of issues in his nested labs. He told me he had not seen this before. We exchanged some information and William asked what NIC I had configured for the nested ESXi VM’s. I was using the good old e1000 NIC. William suggested to try either the e1000e or the vmxnet3 adapter. The e1000e adapter can easily be configured when the guest OS type is set to “VMware ESXi 5.x” To configure the vmxnet3 adapter, you need to edit the vmx file, or change the guest OS type temporarily. I thought it would not hurt to try this, and indeed, when using the e1000e or the vmxnet3 adapter, I could configure jumbo frames without any issues, so it seems the issues I did experience where specific to the e1000 driver. So at least I was able to work around this issue and am able to use jumbo frames again in my nested lab. I am still kind of curious what changed in the e1000 driver or the ESXi layer that caused this issue in 5.5, compared to 5.1 where the issue did not happen. I tried to figure out if there is a way to set a higher debug level fro the e1000 NIC (like on several other drivers) but without succes so far. A special thanks to William whom took some time to exchange thoughts on tho subject and pointed me in a direction to a solution. IMPORTANT UPDATE: When using vmxnet3 adapters for the nested ESXi hosts, even though 8972 byte icmp packets made it to the outside world, TCP sessions did not seem to function OK. This resulted in loss of access to the Datastores and even the nested ESXi server. I was not able to get to the bottom of this, but found out that using the e1000e adapter instead, I can use jumbo frames and there are no issues with connectivity. The e1000e is a “supported” adapter when the Guest OS type is set to ESX 5.x so you will not get the warnings during a vMotion of the nested ESXi server that the NIC is not supported as an ext a bonus. This entry was posted in Issues and tagged 5.5, e1000, e1000e, ESXi, fix, jumbo frames, lab, nested, vmxnet3 by Duco. Bookmark the permalink. Thanks for sharing this. I just found out the hard way and it’s great the solution worked, save me a couple of hours ;-). Cheers Duco! Seriously good post. First, it clearly solved my bewildering problem. Second, nice methodical discussion of the issue and resolution. Thanks for taking the time. Thanks Joel, glad it solved your problem.